Vera supports “event” based automated tasks through the use of Scenes. For example, you can create a “going to work” scene which turns all the lights off and turns the motion sensor on. Another example is a scene which automatically turns a light on if a motion sensor goes off. AutoHTN allows control of Scenes through the Scenes menu. 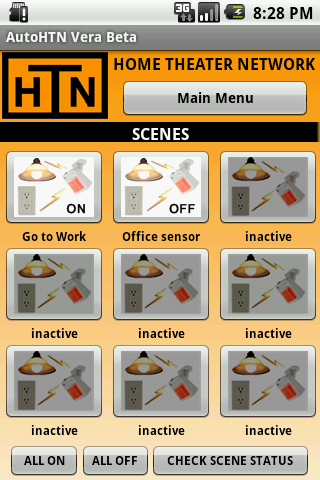 Scenes can be turned on and off with a press of a button.